Looking for that perfect iTunes' upgrade? Look no further than ImTOO iPhone Transfer Plus for Mac. This multipurpose Mac iPhone backup, copy, rip tool takes all of your frustrations out of iTunes' limitations. ImTOO iPhone Transfer Plus for Mac allows you to move files (including audios/videos/pictures and videos shot by the device) freely between your iPhone, Mac and iTunes, convert CDs/DVDs to your iPhone, and transfer DVD folders and ISO images to your iPhone. Still not impressed? Install ImTOO iPhone Transfer Plus for Mac on your Mac and copy files freely between your Mac and iPhone. And of course, it comes with all the regular file management features that iTunes has and is fully compatible with all iPhone models. Newly support iTunes 12, iPhone XS, iPhone XS Max, iPhone XR and iOS 12. To see just how the ImTOO iPhone Transfer Plus can work wonders with your iPhone, simply try it out for yourself FREE! The best iTunes alternative for iPhone to backing up apps, SMS messages, movies, music and photos, pictures/videos recorded by the device from iPhone to Mac, and copying files from Mac to iPhone. You can even manage documents for some apps. Copy iPhone movies and music to iTunes quickly and easily. Newly support iTunes 12. 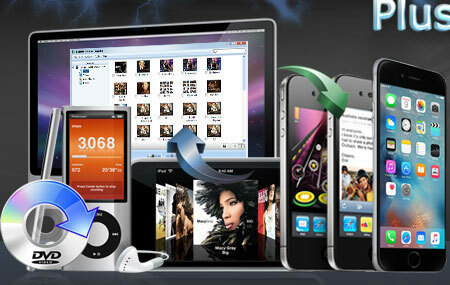 Convert and copy CDs/DVDs to iPhone; copy DVD folders and ISO images to iPhone. Convert video and audio files on Mac to iPhone supported formats, and transfer them to iPhone. Import and export contacts to save the trouble of losing important contacts information. Super-fast file conversion and transfer. Fully support all iPad/iPhone models: iPad, iPad 2, iPad 3, iPad 4, iPad mini, iPad mini 2, iPad mini 3, iPad mini 4, iPad Air, iPad Air 2, iPad Pro (12.9/9.7/10.5 inch), iPod, nano (5th Gen), iPod mini, iPod shuffle, iPod classic, iPod touch, iPod touch 4, iPod touch 5, iPod touch 6, iPhone, iPhone 3G/3GS, iPhone 4, iPhone 5/5S/5C/SE, iPhone 6/6 Plus, iPhone 6S/6S Plus, iPhone 7/7 Plus, iPhone 8/8 Plus, iPhone X, iPhone XS, iPhone XS Max, iPhone XR. Fully support iOS 11 and iTunes 12. Support multiple iOS devices simultaneously. Automatically identifie iPhone and displays device information such as model, capacity, and serial number. Transfer PDF/EPUB books, iPhone ringtones to the device; manage them according to actual need. Not only transfer apps between Mac and iPhone, but also manage documents for some apps. Customize column to show file details and edit the ID3 tag information of several files simultaneously such as title, album, composer, year and so on. Play and preview iPhone media files with the built-in player. Manage and search files just like iTunes. View files in multiple modes including songs, albums, artists and genres; add and edit album covers in thumbnail mode. Add ratings and comments to files. Create and customize playlists or copy playlist to iTunes. Easy-to-use multilingual interface available in English, German, Italian, French, Spanish, Traditional Chinese, Simplified Chinese and Japanese. Connecting device with the software via Wi-Fi supported. Transfer songs from one playlist directly to another. Convert and copy Video, home DVD and Audio for iPhone.